Couple things. I don't like seeing Denard Robinson on the 75% list. Even though he's cleared to play, and everyone knows that, it's still disconcerning to see his name in print on this list. Running backs are going to be thin this week with Shaw and Toussaint out. I'm not suprised to see Shaw out this week, but I am surprised to see Toussaint on the 0% list.He had a huge breakout performance last week against BGSU. 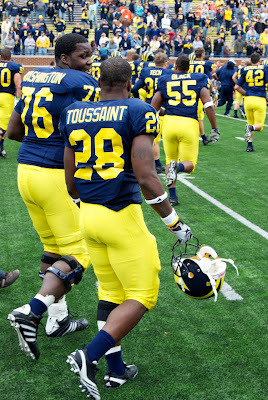 I actually followed him off the field after last week's game (image below) and he didn't seem to be favoring an injury. With Shaw out, I'm really surprised to see Fitz on this list.